Human cancer xenografts in rodents can provide predictive data on the success of candidate drugs in clinical trials and have been a pivotal tool in moving new drugs from the bench to the clinic. However, currently available immunodeficient mouse models have shown some limitation and variability in tumor take rates and growth kinetics. Patient Derived Xenograft (PDX), in which tumor tissue is transplanted directly into rodents after biopsy from the patient, allows for better modeling of the molecular features, heterogeneity, and pathology of the original tumor and for predicting treatment sensitivity. Additionally, it allows for the generation of models for tumor types that have not been amenable to cell line generation. 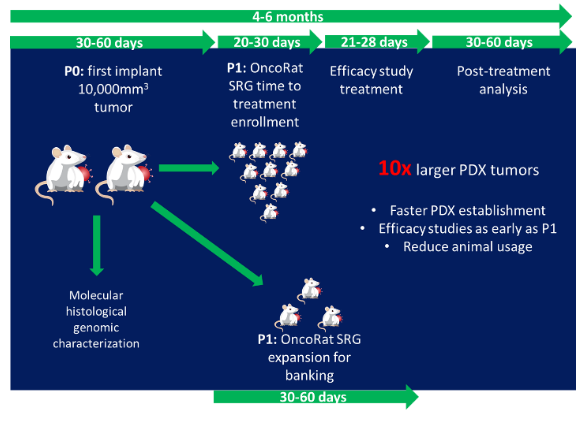 Despite the many advantages of this approach for preclinical research, PDX mouse models are hindered by low engraftment rates and slow tumor growth kinetics. The loss of patient tumor heterogeneity and stromal cells as the PDX is passaged multiple times to generate sufficient tumor tissue to perform efficacy studies is also a disadvantage in the immunodeficient mouse models. To address these limitations, we have demonstrated that the OncoRat has improved tumor take rates and growth kinetics for non-small cell lung cancer (NSCLC) PDXs. The NSCLC PDXs in the OncoRat allow for much larger tumor volume growth, over 20,000 mm3 in the first passage (P0) in the rat, which provides an ample source of tissue for characterization and/or subsequent passage (P1) into OncoRat for drug efficacy studies. Fewer animals are used for the study with faster timelines to drug efficacy data. In addition, we have used genomic analysis to direct a precision medicine approach. One of our NSCLC PDX models harbors a novel activating MET mutation pathway, which would predict responsiveness to type II MET inhibitors. An efficacy study we performed in the OncoRat confirmed this hypothesis as this PDX was highly responsive to the Type II MET inhibitors, but not to Type I. This proof of concept study demonstrates that genomic and molecular analysis can provide actionable insight to guide treatment decisions and that PDX models established in the OncoRat could serve as a unique platform to aid in therapeutic translation. PDX models and OncoRats off-the-shelf for engraftment at the customers facility. 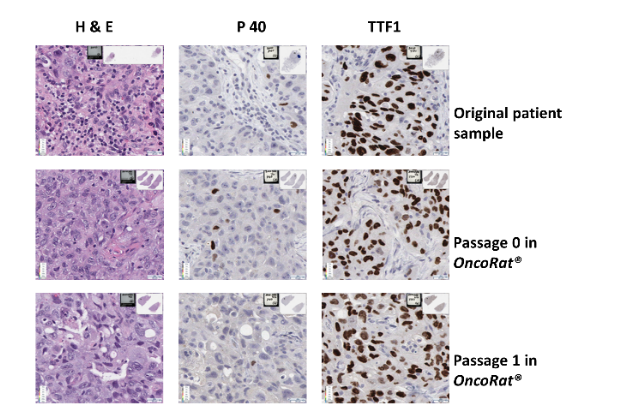 IHC staining for H&E, P40, and TTF1 in original patient tumor sample, first passage (P0) and second passage (P1) in the OncoRat. Schematic of MET receptor depicting the likely pathogenic mutation Y1248H found in patient 3010. 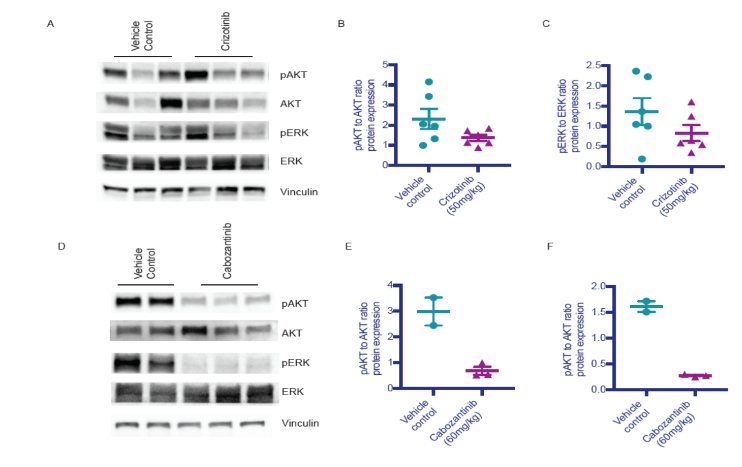 A) Western Blot analysis for phosphorylated AKT, AKT, phosphorylated ERK, ERK, and Vinculin in PDX model treated with vehicle control or drug. Quantification of densitometry depicting ratio of B) phosphorylated AKT to total AKT and C) phosphorylated ERK to total ERK. 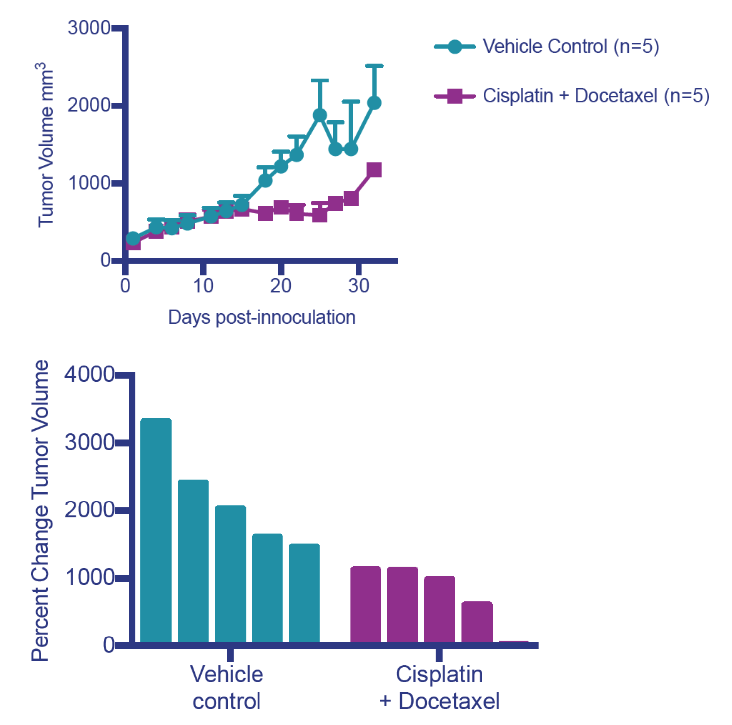 D) Western blot analysis for phosphorylated AKT, AKT, phosphorylated ERK, ERK, and Vinculin in PDX model treated with one dose of vehicle control or drug. Quantification of densitometry depicting ratio of E) phosphorylated AKT to total AKT and F) phosphorylated ERK to total ERK.